Why do I need to blow-out my sprinkler system? Sprinkler blowout services is vital to the health of your underground sprinkler system. Your sprinkler system is buried underground, but not very deep. Your sprinkler heads are just below the surface and pop-up to water your lawn and flower beds, shrubs and more. All of those sprinkler heads are connected with plastic water-lines and those lines are only 6 to 12 inches underground. In Saskatchewan, we have an extreme climate and the ground can freeze as far down as 6 or 7 feet. Water freezes at 0° Celsius, when water freezes it turns to ice and expands. Expanding ice in water lines and lawn sprinkler heads will crack and fail next spring. We use high volume compressors that operate at low pressure. This allows us to stand the water up in the sprinkler line to blow it out. 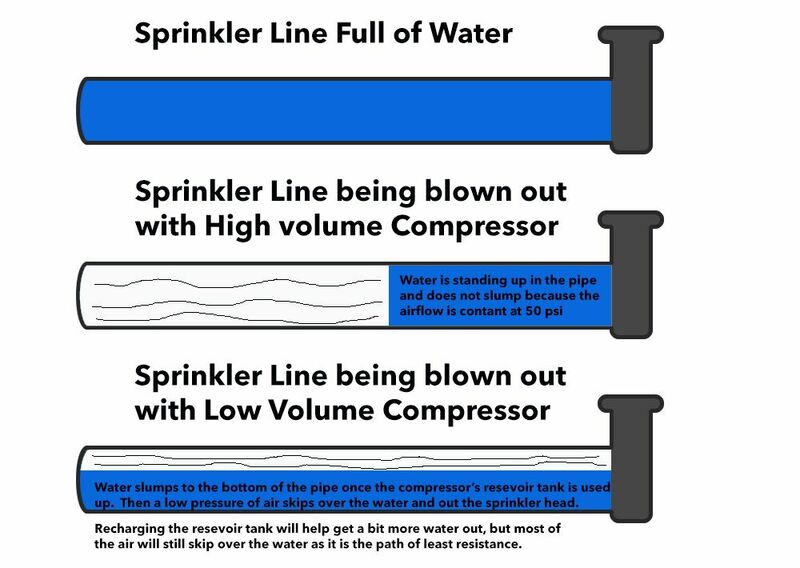 Home air compressors are not high volume, so when the compressor uses up the tank’s reserve, the 2-15 CFMs that a typical home air compressor generates can not effectively stand the water up in the sprinkler line. Rather the water slumps to the bottom of the sprinkler line allowing air to simply skip across the water in the pipe. Weed Pro’s compressors are worth over $15,000 each. They do the job right and that is why we own them. Weed Pro is reliable and dependable. We know some people like to have their sprinklers blown out early and others like to have them blown out later in the fall so we give you some calendar options for the timing of your winterization. You will receive a reminder a couple of days in advance by email. When the job is complete we will leave a notice in your mailbox indicating that your lines have been winterized. It is important to have your irrigation system winterized. Weed Pro uses a high-volume compressor to blow-out all the water in your irrigation lines. This process helps to ensure that there is no freezing in the irrigation lines and prevent repairs in the spring from cracked sprinkler heads or water lines. Watch this short video on how to shut down your system in preparation to having your sprinklers blown by Weed Pro. It also shows you how to protect your system if it is going to freeze outside before your sprinklers are blown out. 1. Do you have sprinklers in both the front and backyard? 2. Any zones with driplines? 3. Do you have a line with a tap at the end, say by the garden or somewhere else?